Early in Baltimore’s history, the site of Riverside Park was used as a lookout point due to its clear panoramic view of the South Baltimore peninsula and Patapsco River. During the War of 1812, Major General Samuel Smith ordered Captain Samuel Babcock to build a circular battery here called Fort Lookout. Commanded by Lt. George Budd during the Battle of Baltimore, the battery played a key role in the defense of the city on the night of September 13th into the early morning of September 14th, 1814. Combined with the garrisons at Forts Covington and Babcock, the forces at Fort Lookout assisted in repelling a British attempt to assault the peninsula by land, saving the city. After the battle, the fort was renamed Fort Wood in honor of Captain Eleazer Wood and the site remained in limited use through the mid 1800s . In 1854, Baltimore approved for public use 3 acres of the old fort along Randall, Covington, and Heath Streets, renaming the property Battery Square. 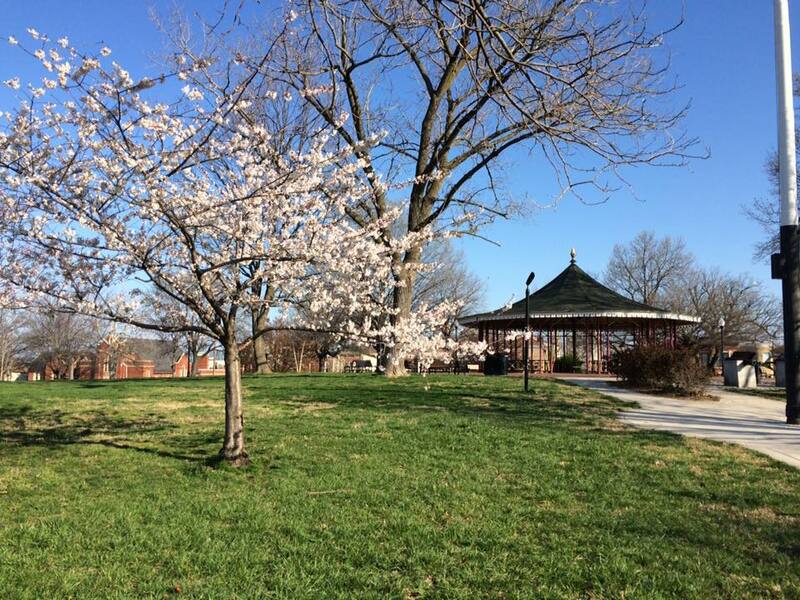 The city formally purchased the 3 acre square in 1862 from James Polk. The city acquired an additional 14 acres to the south of Battery Square in 1873 and renamed the property Riverside Park, making it one of the city’s earliest parks. In 1876, the city passed an ordinance putting the park under control of the Public Parks Commission. 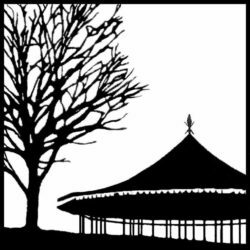 During the Baltimore Railroad Riots of 1877, the park served as an encampment for the Maryland 5th Regiment, where they helped guard the South Baltimore rail lines after assisting with the riots downtown. On August 1st, the MD 5th put on an exhibition for the local residents. The pavilion has become the park’s icon. In the following years, the Public Parks Commission made several improvements to the park, including a large marble fountain in the center, a nursery, and installation of iron railings and gas lighting. In the late 1800s, Riverside Park was a popular gathering place, where it was not unknown for thousands to visit in one day. Later, throughout the 20th century a pool, playgrounds, sports fields and courts were added. 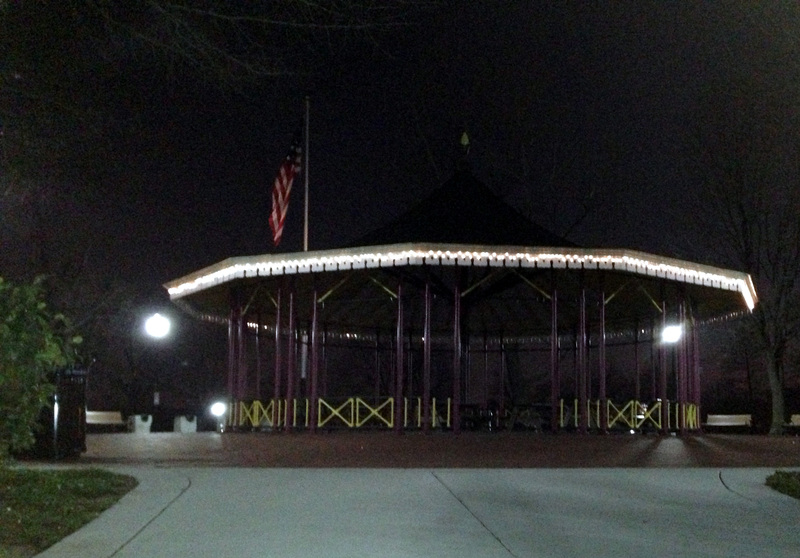 Concerts and events at the gazebo provided a welcome distraction for the immigrant community that sprouted around the park and continue to be a popular attraction for the local citizens. 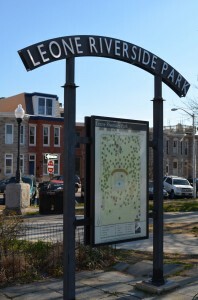 In October 1976, the park was renamed Leone-Riverside Park in memory of Councilman Dominic Leone, Jr. From 2009-2012 the park underwent some major updates. These included: new formed concrete sidewalks replacing older cracked ones that extended all the way to the curb, custom brickwork at selected park entrances, new benches throughout the park, and new trees throughout the park. To coincide with the 200th anniversary of the War of 1812, the National Park Service designated Leone-Riverside Park as a Star-Spangled Banner Trail site. To learn more about the War of 1812 and the Star-Spangled Banner National Historic Trail, visit www.nps.gov/stsp or www.starspangledtrail.net.